The impetus for the trip was the NAMA annual foray in Salem, OR this year. We have friends in the Sierra foothills of northern California, and Gene has been an Oregon lover since way back, so....connect the dots and we have a trip! 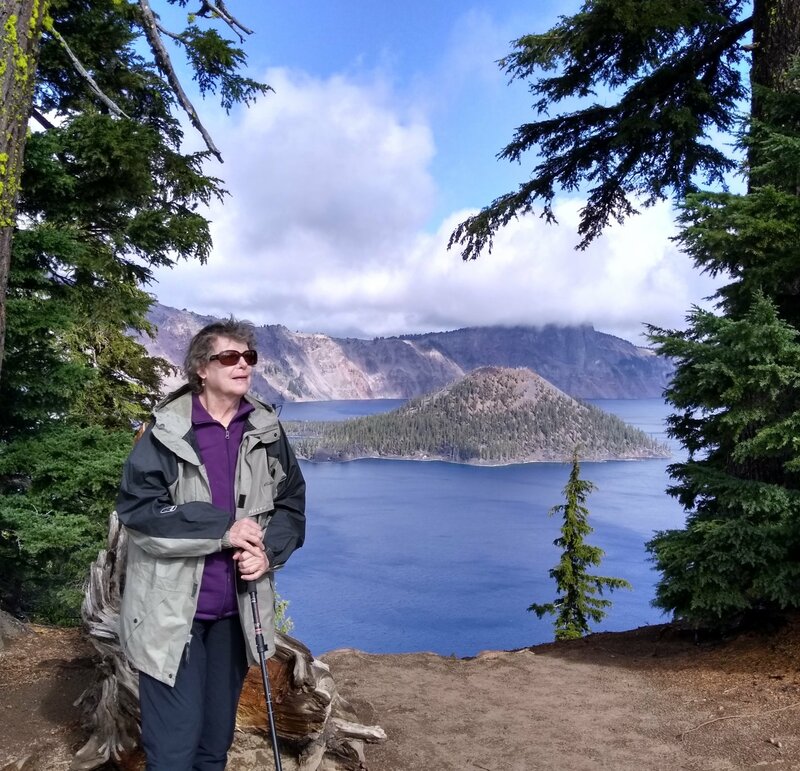 We both have Senior passes to the national parks that are underused and that became another theme; the 'Volcanic Trail' follows the Sierras and then the Cascades and includes Mt.Lassen, Mt. Shasta, and Crater Lake. And some time on the Oregon coast is always something to look forward. Friday-Saturday October 5-6: The flight was uneventful and we arrived mid-evening Sacramento, so made it to "the Cottage" near Big Pines and a nice airbnb cottage about midnight. Breakfast in Murphys CA then we went looking for Steve and Liz who own Milliaire and Black Sheep wineries there. Steve was bringing in the last of the harvest and Liz was at Black Sheep for most of the day. So we went back to the Milliaire Tasting Room and Lana recognized us and treated us to a glass of wine each while we sat in back at their wonderful creekside patio. We went briefly to check out the Grape Stomp which is fine, but kind of a carnival. Teams of stompers pay $70.00 each to stomp grapes for a few minutes (a competition) in costume, and it goes on for much of the day. The main street is booths and Gene had a really nice interaction with a couple of nice young folks who mushroom locally and had dried for sale. In the meantime, there was lunch with Liz: always so wonderful to see her and hear about what's going on in their part of the world. I think in some ways Murphy's is somewhat isolated from what's going on at the coasts and they just try to keep making their fine wines and hang onto a sense of reality. After that it was back to the cottage, buy groceries, and take a nap. We had a lovely dinner of sole with potatoes and fennel and an apple for dessert and were into bed by 8:30 or 9 pm. Quiet. 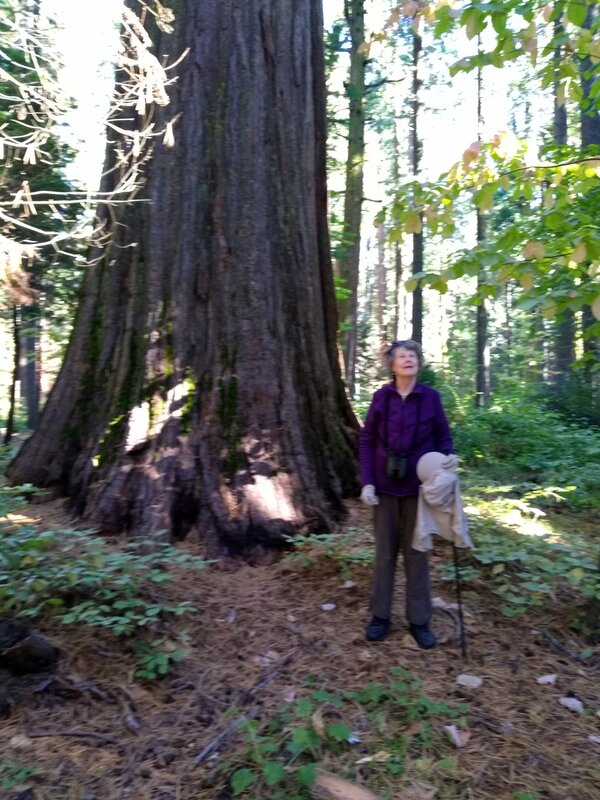 Sunday 7 Oct we visited Big Trees State Park where the sequoias are amazing: huge, and enormous. Wet in the spring; John Muir says "Spring begins in November". Someone on the trail ahead of us said all the side logs--one had a huge tunnel for kids and small adults--will be full of water in a month. One of the books at the cottage was John Muir's "My First Summer in the Sierras" which paints a lovely picture of the area at that time. We also met a couple from North Oaks, MN when we stopped to admire bluish oyster mushrooms growing on a pine log. They have aspen on their land and were going to try to remember the scent (anise) in the spring and look for them next spring. It was a wonderful walk. Gene walked to accommodate and Karen made it through the 1.3 mile North Grove hike, which I was pleased about! Drove the winding road to the South Grove area and Gene walked part way out; gorgeous! We had dinner with Liz and Steve, their daughter Kathy, and friend Merita, who is running again for District Supervisor. She held the position for 20 years and last election was defeated when people wanted to throw out all the incumbents. Now she is running against Michael Olievera. The election is on our minds. We will see if there's a blue wave for the mid-terms. I'm beginning to doubt it. Kavanaugh's confirmation roused up the conservatives who will now come out in force to vote. Our host at our next stay overnight in Mt. Shasta, CA said more recent polls showed the Republican party gaining ground. Hopefully that's short-lived. Sunday 7 Oct: Mt. 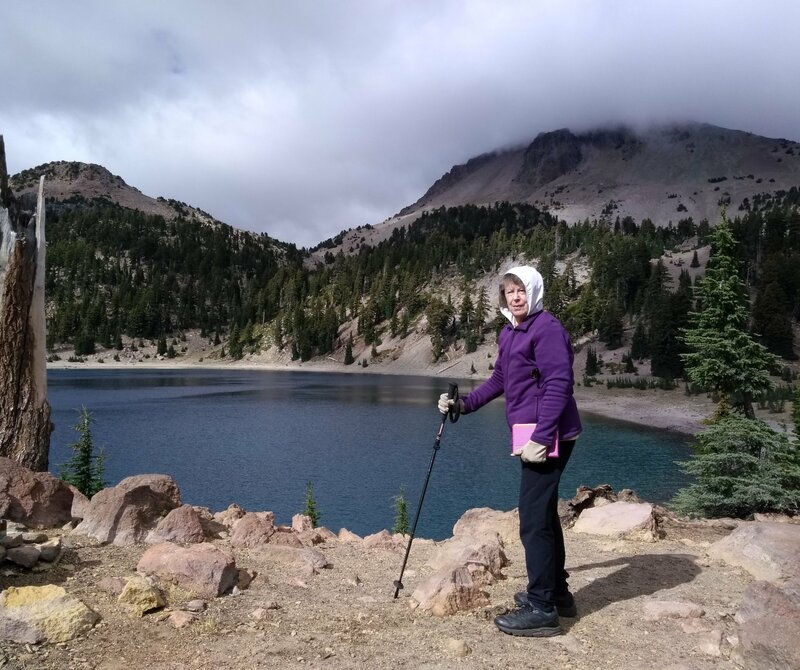 Lassen Volcanic Park was on our way and we spent a good part of the day exploring it. We saw at least one hot spring, shortly after entering the Park, there were probably a lot more but not on our route. There were four kinds of volcanic rock: shield, cinder cone, plug dome and composite, and fumaroles, (we saw one at Sulphur Works on the way out of the park) and many active volcanoes. Twisty, wind-y beautiful road, quite slow but we were in no hurry. We had lunch by an alpine lake and lots of great views. We drove the entire road through the park, which took us perhaps three hours, and stopped at most of the highlights. We particularly enjoyed Chaos Crags and Chaos Jumbles near the north end of the park. We stayed overnight in Mt. Shasta, CA with a wonderful host who ended up sharing our Milliaire and our political views. It was a really lovely place to stay with a view of Mt. Shasta out his back windows. Told this was the clearest view of Shasta all year due to the fires. We found the farmers' market in the small downtown and found fresh oyster mushrooms that we had with fennel on pasta we cooked at Tom's. Nice day, nice place, nice night. Monday 8 Oct: A drive up the dry side of the coastal ranges and some lovely agricultural areas and Klamath Falls area to Crater Lake National Park. Crater Lake is beautiful and the deepest lake in the U.S.; at 1,943 feet it's deeper than Lake Superior. Still lots of people at each stop, and windy! Sometimes the road is closed with snow this late in the year. Headed north out of the park, we made our way slowly down beside the North Umqua River which runs for nearly 100 miles next to the road barely touching the accelerator all the way. We stopped at Steamboat Inn on the river for a lovely lunch; this would be a great place to stay. Finally we reached the coast at Reedsport, bought groceries for the next few nights and on to our cabin on the Oregon coast right across the Coastal Highway 101 from the ocean! This was the nicest place we stayed, by far. We bought three nights' worth of romaine, tomato and Parmesan cheese together with a lime, fish, and olive oil to go with a nice Ghirardelli Old Vine Zin (got a case at Milliaire). Can you tell we like to cook on our trips? Tuesday-Wednesday 9-10 Oct: We spent the next two days checking out the coast. Changed a bit since Gene came here in his twenties. 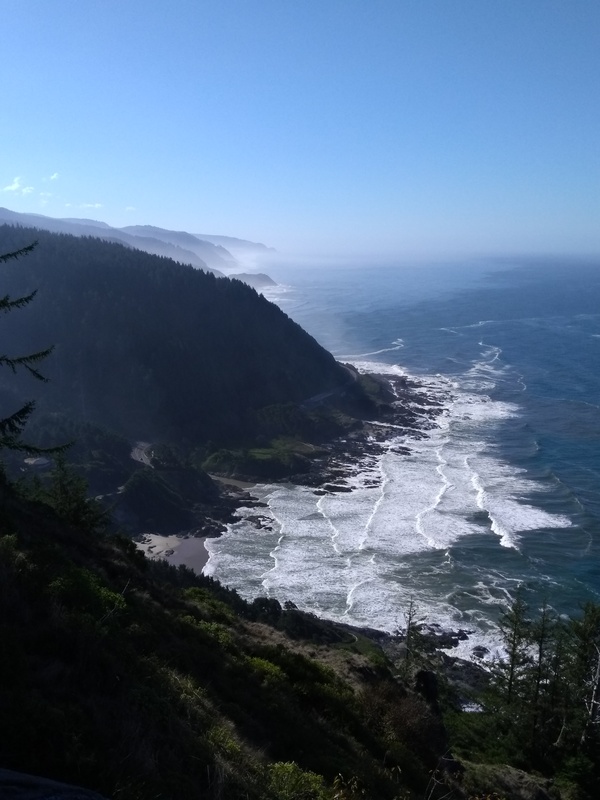 Cape Perpetua National Park is a must see and walk; we drove up to the lookout and took the loop out to an old CCC rock shelter overlooking the ocean. Then we just kept stopping at most of the parks all the way up to Yachats, where we had lunch at the Pub (good food, but ice cold Guiness?). On the way back we checked out the stops we skipped on our way up. I got to walk on the beach once, so I can do it in Sanibel in January, God willing! Back south along the coast, another great dinner: a nice cut of pork with vegetables and noodles, a great romaine salad and, of course a bottle of Milliaire. To bed and to sleep by 9 pm. Comfy travellers. Thursday 11 Oct: Although we planned to get to the NAMA site in Salem today, the route there was worth the trip. Up the coase again but farther to Newport, then inland through mountains and forests; Google took us through some neat blue highways and along rivers. In fact, the best foray from Salem was back almost to Newport. For lunch we munched leftovers at an OR State Roadside on a river with big oaks and friendly people. We managed to avoid the freeways until Gene had to go into town to drop off the rental car. McCleary Center--the site of the NAMA meetings--is a very well appointed retreat site and we had a condo to ourselves (more than expected). Still dry; there was a grass fire a quarter mile away but handily put out. Which means the local mushrooming was a bit limited, notwithstanding Oregon is 'god's country' for mushrooming in the USA; the rains start in late October. Always good to see nice 'once a year' people or friends in a different context. As Gene is an 'out of state' member, he was glad to be included in the Michigan attendees picture. After a good dinner and welcome and a great orientation talk we hit the social hour to meet more people. Friday-Saturday Oct 12-13: Sam Landes did a great job again organizing the logistics and speakers with help from local people. An added theme was to use more local/regional speakers and activities. In this case, the rich and plentiful organizations and businesses that surround mushrooming in the northwest. 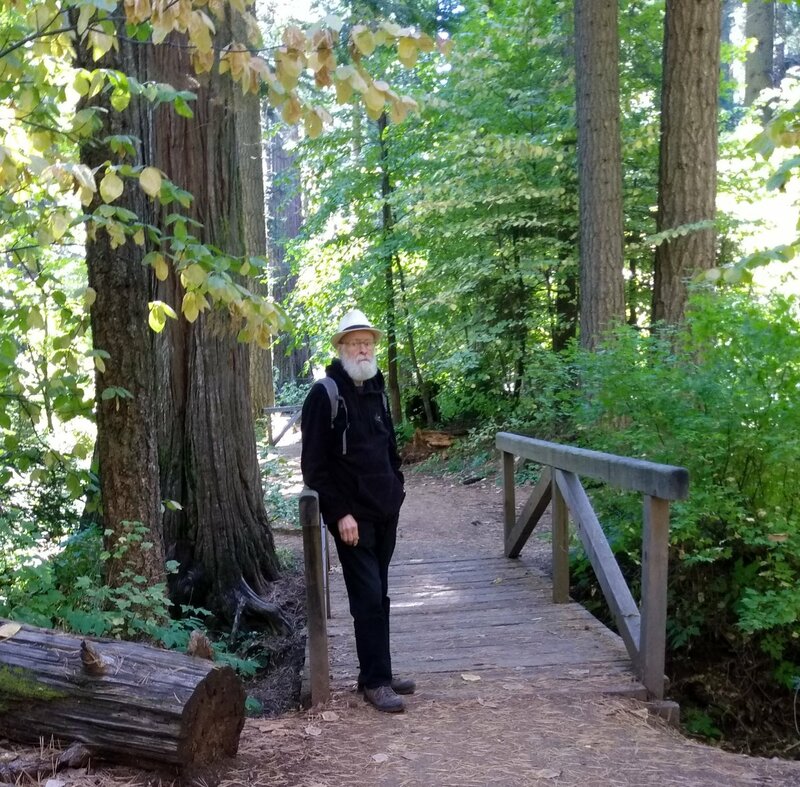 Ron Hamill shared his interesting insights on fungi and their forests in western Oregon. Ja Schindler of Fungi for the People near Eugene OR talked and helped hands-on tissue culture. Richard Tehan, a biochemistry student amazed us with what we are getting to know about mushrooms and molecules. Seri Robinson who teaches at a local college demonstrated wood turning with examples of spalting. Charles LeFever, an entrepreneur who has promoted the truffle festivals in the are talked on truffles. Joey Spatafora updated us on the the changes in fungal genomes. And much more. We spent most of Sunday travelling home. Thanks to Charlotte Caplan we got to the Portland airport and got our shuttle back to Duluth; home late but sound. Another interesting trip!